Stops Damage Spray Rebuilder Treatment was specially developed to promote revitalization, shine and softness. Stops Damage Spray Rebuilder Treatment was specially developed to promote revitalization, shine and softness. 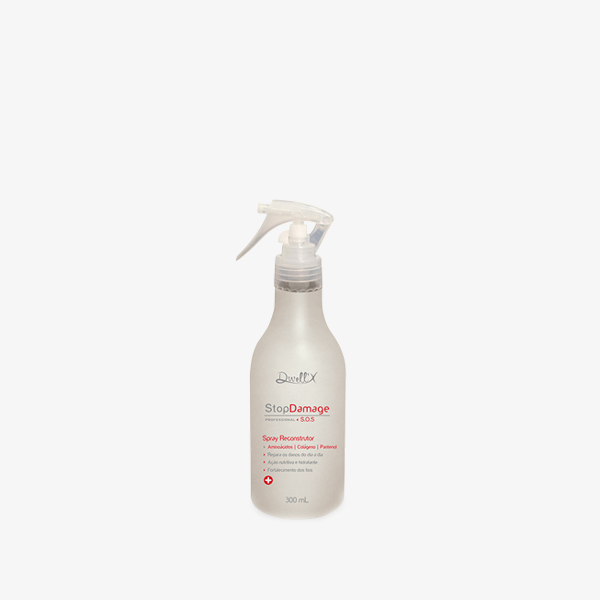 With nourishing, repairing and moisturizing active ingredients, the Spray Rebuilder works efficiently in rebuilding damaged areas of the wire, and the mascara (sold separately) is enriched with nourishing and revitalizing actives that enhance damaged structures and protect against aggressive agents. Formulated especially for chemically treated hair, it has anti-seizure effect, combats elasticity and porosity caused in the threads by the chemistry. It also has active collagen, amino acids (rich in keratin) and panthenol, restore hydration and nutrition by restoring movement, shine and softness. Damaged and fragile hair that has undergone chemical treatment or not. After washing the hair with a deep cleansing shampoo, dry it with a towel and apply the Stop Demage Spray all over the hair. Use thin toothed comb to help spread the product. Wrap it with a thermal cap, apply heat for 10 minutes. Let the hair cool slightly and rinse thoroughly. To increase the softness of the hair, apply the Damage Mask (sold separately).